Ladies Gaelic Football Achievements: (Within last 5 Years) Club: 4 senior championships, 5 senior leagues. School: 2 Connacht Championships. County: Minor and u16 All Ireland championship medal. 4 Connacht championship medals. Favourite Sporting Moment: (Ladies Football) Winning County Minor All Ireland. Favourite Ladies Gaelic Players: Angela Walsh, Valerie Mulcahy, Sinead Ahern. Most embarrassing moment on or off the football field: u14 captains speech after winning Connacht Final. Influences on your career: My underage trainers. School: Presentation College Tuam Club: Corofin County: Galway Position: Forward Ladies Gaelic Football Achievements: (Within last 5 Years) Club: 4 senior championships, 5 senior leagues. School: 2 Connacht Championships. County: Minor and u16 All Ireland championship medal. 4 Connacht championship medals. Toughest opponent: Caroline Mcging When did you start playing Ladies Gaelic: 6 years old Favourite Sporting Moment: (Ladies Football) Winning County Minor All Ireland. Biggest Disappointment: Losing All Ireland schools semi final. 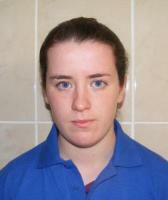 Favourite Ladies Gaelic Players: Angela Walsh, Valerie Mulcahy, Sinead Ahern. Most embarrassing moment on or off the football field: u14 captains speech after winning Connacht Final. Favourite Food: Cornflakes Favourite Ground: Croke Park Favourite Ladies Gaelic Football Skill: â€œThe Dummyâ€ Your Ideal Job: P.E Teacher Person you would most like to meet: Steven Gerrard One rule you would change in our game: Square Ball Influences on your career: My underage trainers.